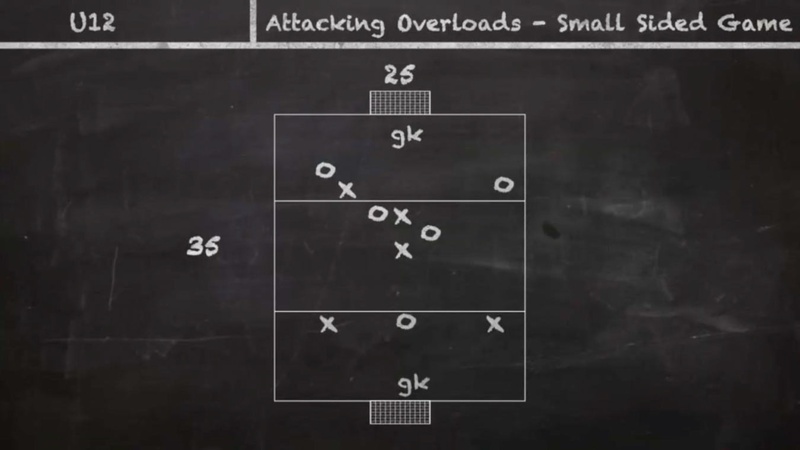 Description: Purpose of session is to make players aware of what an overload is, basics on how to create an overload and where it could help on a match day. Players in groups of 4-6 have 1 ball and are split into two groups facing each other 5-8 yards apart. Two touch passing, first touch to control out of feet and second touch a firm pass into feet of opposite player. After pass the player joins opposite group and waits to repeat. 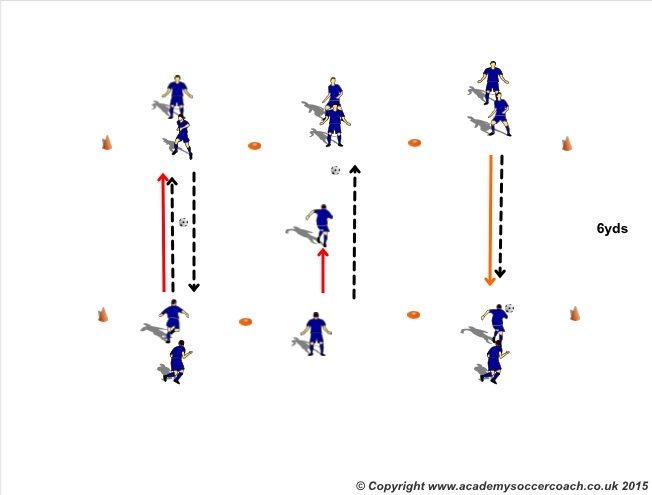 – Why is quick passing necessary? Set-up a pitch with goals on each end-line. Divide the pitch into thirds. Split group into two teams, including goalkeepers. Teams each have two players starting in their defensive third, two in the midfield third and one in the opponent’s third. Play handball. Players have to throw and catch the ball and the player with the ball cannot run. Players can score with a header. When a team has the ball their players can move anywhere on the field. But when out of possession they must return to their starting positions. Let players finish with a volley. Keep it fun, encouraging everybody to get forward and try to score. Set-up a pitch with goals at each end, and divide into thirds. Teams have a GK plus 2 players in their defensive third, two in the midfield third and one in the attacking third. Players can go anywhere when their team has the ball and must stay in their own zones when out of possession. Play to score. Goals are worth double if there is an overlap or underlap run in the attacking third during the build-up.